This link will take you to a list of English language readers including fiction and non-fiction. You may be locate the books by searching on the title in the box above. 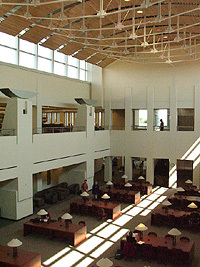 Academic libraries contain materials that support the curriculum, or what is taught and studied at the college or university. Most academic libraries use the Library of Congress (LC) Call Number System to organize their physical items. from Kimbel Library on Vimeo. When you write papers for your college classes, it is extremely important to cite your sources using a particular citation style. APA and MLA are examples of commonly used citation styles. Always ask your professor what style you should use. Choose a citation style (APA, MLA, Chicago/Turabian, etc) and follow the guidelines for formatting your paper and references.